At the General Assembly in Sofia, Bulgaria in 2015 FIG Council t introduced the Honorary Ambassador title as a special consideration to partners and other stakeholders who have done a considerable work for FIG over many years. Dr. Clarissa Augustinus, UN-Habitat, has worked closely with FIG for many years through her position in UN-Habitat and since the establishment of the Global Land Tool Network (GLTN). 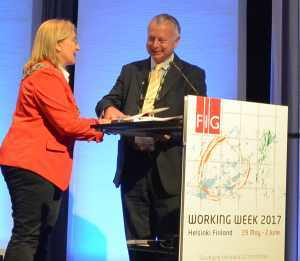 FIG Council wanted to acknowledge the longstanding cooperation with Clarissa Augustinus that has lasted throughout many councils and FIG presidents. Clarissa Augustinus is founder and Lead on the Global Land Tool Network. Clarissa Augustinus is in June 2015 standing down from UN-HABITAT. On 29 May 2017, FIG Council brought to the General Assembly the appointment of Paul Munro-Faure as the second appointed FIG Honorary Ambassador. During the Opening Ceremony of the Working Week on 30 May the certificate was presented to Mr Paul Munro-Faure.